I’ll be the first to admit that when it comes to laundry, I’m not always…prompt. I’ll wait until the clothes pile up, then do all of the laundry in one sitting. More often than not, that last load of laundry sits in the dryer until I either a) run out of clean clothes or b) I’m reminded that they’re there when I’ve done laundry again weeks later. (Oops.) 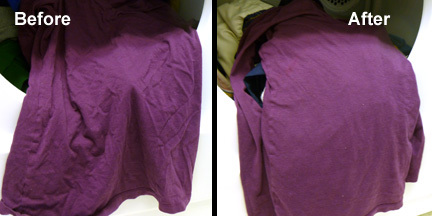 Spending weeks in the dryer virtually guarantees wrinkles on every single item in that dryer. Fortunately, there are ways to quickly and easily get those wrinkles out. And I don’t mean ironing. Mister Steamy Dryer Balls are revolutionary new dryer balls that utilize the power of steam to remove wrinkles and creases with ease! Just add a small amount of water and toss it in! As your dryer heats up, Mister Steamy Dryer Balls steam up to effectively release wrinkles and creases. Plus, Mister Steamy Dryer Balls soften your clothes as they dry for fluffier fabrics without chemicals or dryer sheets…saving you money! Need a shirt in a hurry? Mister Steamy Dryer Balls are the fastest way to get wrinkles out without getting the iron out. From cottons to poly’s to blends, let Mister Steamy Dryer Balls get the wrinkles out for you! If we’re being totally honest, the Mister Steamy kind of looks like a dog toy. 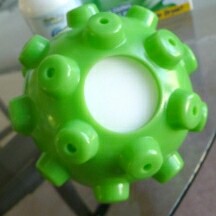 I mean, it’s a ball with little nubs all around it and it would bounce along the ground if you rolled it. But you know what a dog toy doesn’t do? It doesn’t get those annoying wrinkles out of my t-shirts. You know what the Mister Steamy does do? It helps get those annoying wrinkles out of my shirts. I decided to put it to the test. As part of my entirely and completely well-planned review process, I just happened to have a batch of clothes in the dryer from about two weeks ago. Yup. All part of the plan. I followed the directions on the Mister Steamy. I filled the ball with 4 ounces of water – the sponge inside quickly absorbed the water without any leaks. I took the water filled Mister Steamy and threw it in with the completely wrinkled clothes for 15 minutes on high heat. Of course, once you turn the dryer on, you can hear the Mister Steamy bouncing around inside. I think that it was beating and steaming the wrinkles out simultaneously, because in that short amount of time, the Mister Steamy was able to noticeably reduce the wrinkles on my shirts. Next, I decided to follow Mister Steamy’s suggestion of replacing my dryer sheets with a Mister Steamy. This time, I had a freshly washed load of laundry. I diligently filled the ball with 4 ounces of water and put it into the dryer along with my clothes. This time, I set the dryer to low heat and it was on for about 45 minutes. This would test whether it effectively reduces wrinkles, static, and acts as a fabric softener. The final verdict – absolutely. In one day, I did five loads of laundry, testing with a dryer sheet, with a Mister Steamy using only water, and with a Mister Steamy using water and a shot of Mister Steamy’s Fresh Shot. I found the Mister Steamy (using only water) to work just as well as the dryer sheet. In fact, I thought that the Mister Steamy made my clothes smell better and feel softer than when I used a dryer sheet, simply because I think it helped to activate the softener that is in my detergent. Who knew fresh smelling, static-free and wrinkle-free clothes were possible with just a ball and some water? Currently, the Mister Steamy comes with two dryer balls (each lasts 3 to 6 months – depending on how long the sponge inside lasts) and two bottles of Mister Steamy Fresh Shot. 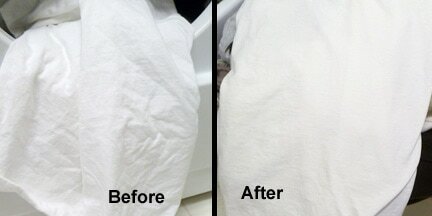 Fresh Shot can be used as a between loads way to freshen up clothes in the dryer without washing. I’m not sure how often that happens, but maybe if you’re taking clothes out of storage and they aren’t dirty but you want them to smell fresh, it’s a viable option. The Fresh Shot scent gives the clothes a mild clean smell that isn’t overly perfumey. I’ve always used a damp (clean) wash cloth and can get wrinkles out that way–I’m too cheap to buy Mister Steamy–but it looks like it’s a good product that works.